This Salem Witch Map Skull Jewelry Box Statue is 7.25" tall 6.5" Long and 4.5" Wide approximately. 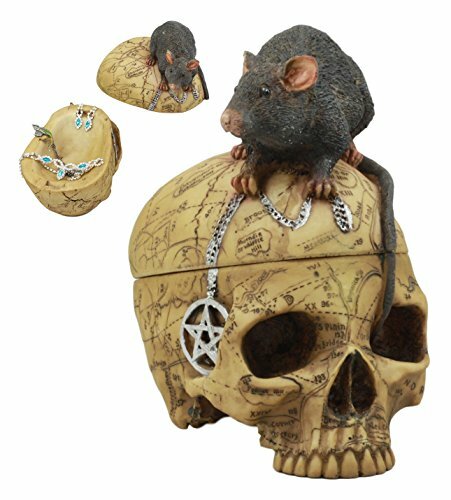 This Salem Witch Map Skull Jewelry Box Statue is made of composite resin hand painted and polished individually. The Colonial Salem Witch Skull is made with intricate details showing the Salem Village, the primary location of the Salem Witch Trials history, as it looked in the 1962 past. It is topped by a mouse and a pentagram emblem amulet carved into the side of the skull. This Salem Witch Map Skull Jewelry Box Statue is 7.25" tall 6.5" Long and 4.5" Wide approximately. This Salem Witch Map Skull Jewelry Box Statue is made of composite resin hand painted and polished individually. The Colonial Salem Witch Skull is made with intricate details showing the Salem Village, the primary location of the Salem Witch Trials history, as it looked in the 1962 past. It is topped by a mouse and a pentagram emblem amulet carved into the side of the skull. This is an Ebros Gift And Atlantic Collectibles exclusive collection. Jewelry and Accessories in photos are not included. If you have any questions about this product by Ebros Gift, contact us by completing and submitting the form below. If you are looking for a specif part number, please include it with your message.